1- Original quality of the footage: from what source is the video? gopro, camera, video camera, mobile phone. . .
Our video captured with Panasonic G7 to 4K with 100mbps h264 codec and bitrate. FACEBOOK compresses videos only 720p at a low bit rate, for the HD version 1.5 mbits max bitrate while the SD version only 250Kbits (0,250mbits). For this reason HAS NO SENSE send video on facebook to 4K (3840×2160) or full HD 1080p (1920×1080), as the Facebook server will resize ALWAYS bringing any video at a maximum resolution of 720p (1280×720). Indeed, it is recommended to resize the video to be sent on facebook at 1280×720 BEFORE you send it. The main reason is the size (weight in MB) that will obviously be less which means less time to upload, it is also wise DO NOT RESIZE to Facebook because you lose sharpness. So better to send a video on Facebook already downsized to 720p, it saves on time and you gain in quality. For bit rate (ie the amount of video data) must find the right balance that results from the tests is to be considered around 16Mbits, max 20mbits in the case of video with many moving scenes. X264 CRF (in constant quality) and 18 preset as the medium. Why the video I posted on facebook you see evil? It has no quality despite being in HD? 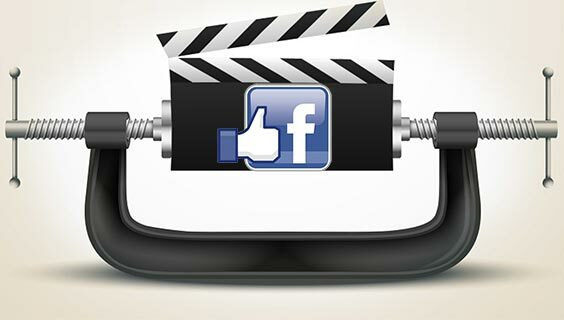 The key issue is the origin of the movie, which device was filmed the movie to be sent on facebook. The quality of a semi pro camera or a camera like the Panasonic GH4 that records to 200mbps in h264, is quite different than a gopro with a small sensor or even a mobile phone. The videos listed were compressed with MeGUI x264 at 1280×720 setting the video converter to 16Mbps CRF 18 preset medium. This is the quality achievable on Facebook, of course not comparable to that of youtube or vimeo.